Find the important physicians working in internal medicine at numerous hospitals, clinics, and medical institutions in one organized and accurate contact directory. Pull a lead list of influential doctors and find the decision-making physicians you need to talk to now. Patients requiring complex investigation and unique diagnoses often see physicians with the specialty of internal medicine. These tend to be more experienced doctors, often helping other physicians with coming up with the right diagnoses and treatment plans for their patients. They are sometimes called “internists" and tend to focus exclusively on adults. These are some of the most recognized and respected doctors out there, sometimes called colloquially the “doctor's doctor." 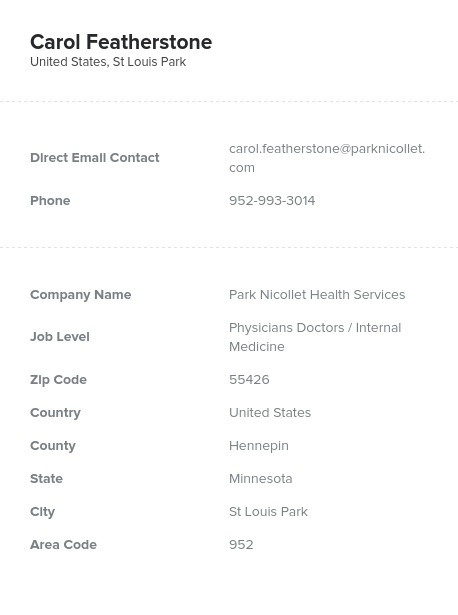 This mailing lead list from Bookyourdata.com contains the contact information of that unique, qualified, and influential group of physicians. With Bookyourdata.com, you can get the direct contact information of a group of physicians most often protected by red tape. Directly connect with the hard-working decision-makers at hospitals and other medical organizations in a few clicks. Download a list of internists within a few minutes, then start networking with and marketing to this group. These highly sought-after contacts are available at an affordable, transparent price. Use this information to reach out to high-ranking doctors and start conducting your marketing campaign more effectively. Find internists with the help of this database. It's pre-built and ready for you to download now. Just integrate it into your CRM, and then start connecting with internal medicine doctors within minutes.